(Nanowerk News) In December, a NASA mission to study the sun will make its third launch into space for a six-minute flight to gather information about the way material roils through the sun's atmosphere, sometimes causing eruptions and ejections that travel as far as Earth. The launch of the EUNIS mission, short for Extreme Ultraviolet Normal Incidence Spectrograph, is scheduled for Dec. 15, 2012, from White Sands, N.M. aboard a Black Brant IX rocket. During its journey, EUNIS will gather a new snapshot of data every 1.2 seconds to track the way material of different temperatures flows through this complex atmosphere, known as the corona. A full study of the sun's atmosphere requires watching it from space, where one can see the ultraviolet, or UV, rays that simply don't penetrate Earth's atmosphere. Such observations can be done in one of two ways – send up a long-term satellite to keep a constant eye on the sun, or launch a less expensive rocket, known as a sounding rocket, for a six minute trip above Earth's atmosphere to collect data fast and furiously throughout its short trip up to an altitude of 200 miles and back. Unlike a conventional image, NASA's Extreme Ultraviolet Normal Incidence Spectrograph will provide what's known as "spectra" such as above, which show lines to highlight which wavelengths of light are brighter than others. That information, in turn, corresponds to which elements are present in the sun's atmosphere and at what temperature. "Six minutes doesn't sound like much," says solar scientist Douglas Rabin who is the principal investigator for EUNIS at NASA's Goddard Space Flight Center in Greenbelt, Md. "But with an exposure every 1.2 seconds, we get very good time resolution and a lot of data. So we can observe minute details of how dynamic events on the sun happen over times of two to three minutes." Watching the sun at this kind of time cadence helps scientists understand the complex movements of solar material – a heated, charged gas known as plasma – as it heats and cools, rising, sinking and gliding around with every change in temperature. Adding to the complexity of the flows are magnetic fields traveling along with the plasma that also guide the material's movements. This writhing atmosphere around the sun powers an array of solar events, many of which stream out into the farthest reaches of the solar system, sometimes disrupting Earth-based technologies along the way. "Ultimately all of our research is geared toward addressing key outstanding questions in solar physics including how the sun's outer atmosphere, or corona, is heated, what drives the solar wind, and how energy is stored and released to cause eruptions," says Jeff Brosius, a solar scientist at the Catholic University of America and a EUNIS co-investigator based at Goddard. But teasing out how this energy moves through the corona is not a simple process. Different types of observations and techniques must be combined to truly track how different temperature material courses around. The technique that EUNIS uses to observe the sun is known as spectroscopy. Taking pictures of the sun is one very useful form of observation, but it requires looking at just one wavelength of light at a time. 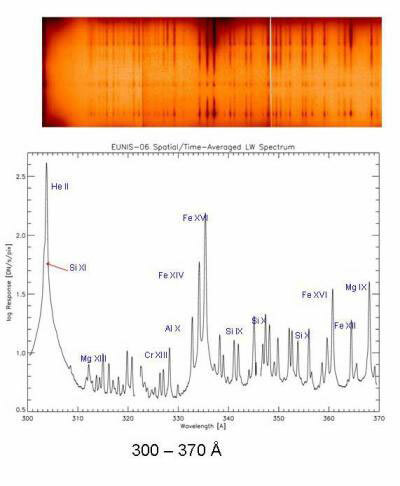 A spectrometer on the other hand does not provide imagery, in a conventional way, but gathers information about how much of any given wavelength of light is present, showing spectral "lines" at wavelengths where the sun emits relatively more radiation. Since each spectral line corresponds to a given temperature of material, this provides information about how much plasma of a given temperature is present. Capturing many spectra during the flight will show how the plasma heats and cools over time. Each wavelength also corresponds to a particular element, such as helium or iron, so spectroscopy also provides information about how much of each element is present. Each spectrographic snapshot from EUNIS is based on light from a long, narrow sliver running across about third of the visible sun -- nearly 220,000 miles long. "Looking at a small slice of the sun at such fast time cadence means we can look at the evolution and flows on the sun in a very direct way," says solar scientist Adrian Daw, the instrument scientist for EUNIS at Goddard. Repeated sounding rocket flights offer significant advantages compared to orbital missions in terms of the measurement flexibility. Each separate flight can focus on the specific measurements that are most valuable, adjusting, as necessary, making improvements and emphasizing different aspects of the sun. Improving time cadence, for example, may be necessary to study the dynamics, however this inherently limits the observational resolution as the instrument gathers less light for any given snapshot of data. This flexibility in emphasis for each flight greatly enhances the scientific return. This launch is the third for the EUNIS mission, but the tenth in a line of similar rockets where the predecessor was named SERTS for Solar Extreme-ultraviolet Research Telescope and Spectrograph. On each flight the scientists turned their attention to focusing on a different aspect of their research. During this flight, the instrument will observe a band of extreme ultraviolet light with wavelengths from 525 to 630 Angstroms with better sensitivity and greater spectral resolution than any previous instrument. This set of wavelengths covers a wide range of temperatures, representing solar plasma at 45,000 to 18 million degrees Fahrenheit (25,000 to 10 million Kelvin) which includes the temperature ranges of material from near the sun's surface to the much hotter corona above. Since we do not yet understand why the corona gets hotter the farther it is from the sun – unlike, for example, a fire where the air gets cooler farther away – studying such a wide range is crucial part for understanding that process. With a six-minute window, EUNIS is unlikely to see a specific large eruption on the sun such as a solar flare or coronal mass ejection (CME) but since the sun is currently moving into the height of its 11-year cycle, they do expect to see a fairly active sun. "The last two times EUNIS flew were in 2006 and 2007," says Daw. "Now the sun is waking up, getting more active and we're going to see a whole different type of activity."